FALL is a time of reflection for me. Like nature with its glorious colors and variety so is life - full of change and challenge. And meeting challenges and improving women's lives locally and around the world are what Zonta is about - what we are committed to. An example of a true Zontian is our October speaker, Jillann Richardson-Rohrscheib, a professional in micro enterprise and micro lending. She shared her heart for the women of third world countries as well as her life in those countries and the people she worked with giving them tools to make a living and improve their families lives. What a lady! Wish you all could have heard her. An upcoming event that helps enable us to serve other women and make their lives brighter in some way is our upcoming nut sale. Pat Kosley and I talked about the fact that we have been selling nuts as a project for about 14 years. The first year we purchased about 500 pounds and this year have almost tripled that amount with 1365 pounds on order and the anticipation of $3,167 in sales for our service projects. How it has grown! The nuts will arrive the first week of November and we will bag them at Pat Kosley's house on November 8th right after work. Pat has promised to provide us with some of her delicious soup. So everyone who can come and bag, be there - it's a lot of fun and good fellowship. Visit the new scrapbook from the October 2004 Meeting. Photos courtesy of Rosalie Dorland. How proud I was to hear our speaker at our last general meeting, Jillann Robinson-Rohrscheib, a Zontian, talk about her experiences living and working with disenfranchised women. Like many of you, I have not had, nor taken, the opportunity to put myself at personal risk to advance the status of women, and I am in awe of those who do. As Jillann related, there were many satisfying and happy moments in these situations also. We could see that Jillann is not a complainer, but a doer! Many thanks for a great presentation! As a personal comment, I thought some of the members were going to rise up and attack me for stopping her presentation, thank you for your restraint! The new member arena has been great fun these past couple of weeks. One potential member, Pat Rosas, has been approved by the board and will be installed at our next general meeting. Another potential member, Diane Riggs, has paid her dues and her application has been submitted to the board for approval. There is one other woman that I will be meeting with this week who appears to be very interested in our club also. All three of these ladies attended our last general meeting. There are a couple of Zonta fund-raisers coming up in Denver, if anyone might want to venture north. Greetings, Hajimemashite, Mucho gusto, Ahlan wa sahlan, Dag! My name is Liz Groothof Croddy. I have enjoyed being a member of the Pikes Peak Area Zonta Club for many, many years and have served in almost every officer position available in our local club through the years. One of my favorite memories is that of the day I got a hug from Anwar Sadat's widow, Jehan Sadat, at the Zonta International Convention in Dallas. 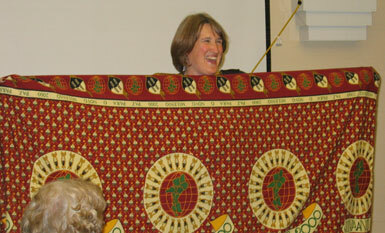 Jehan was the keynote speaker and became an honorary Zontian on that day. Almost all of us in the Pikes Peak Area Club had read her memoirs, and I had brought the book with me to get her signature. I wanted to stand out from the others, so I shouted at her, as she came out of a cocktail party room with her two armed bodyguards, "I love you, please write your name in your book," -- in my broken Arabic! Her bodyguards looked very nervous, but she gave me a big hug and signed my book and said some very kind words to me. I have since traveled to Egypt and seen the monument her husband was dedicating on the day he was assassinated. I will always remember that special hug from a woman who has done so much to elevate the status of women in her homeland. I teach high school students foreign languages at a national school of excellence. My specialties are currently Spanish and Japanese, but I have taught several other languages. What attracted me first to Zonta was the international connection, including Zonta's work through the United Nations, especially Unifem and Unicef. I am most proud of Zonta's work in developing countries around the world, as well as the communities we support at home. This photograph is of me and my son. Many years ago I coined the term "Zonto" for our supporting menfolk. 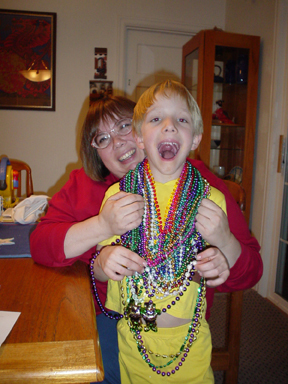 My husband and my son are well aware of and support my work through Zonta. Last year they both helped me pack nuts for our yearly fund-raiser. I believe that we must work to support and educate our men if we are to raise the status of our women. I treasure the many friends and acquaintances that have come my way through Zonta. It is such a privilege to be in the company of so many good and gracious women, from many professions, many whom I would not have met through my usual career opportunities. Becoming a mom and balancing my work in Zonta has been a struggle, and I have seen several new moms leave the club because of the time management conflicts and also because they have decided to become stay-at-home moms. I have continued working as a teacher thanks to my husband, who was able to give up some worktime during the day to be there for our son; his home-based profession allowed him to do this, while other households do not have this chance. Becoming a mom so late in life (at the age of 40) has made me keenly aware of the tension that exists between the goal of Zonta to attract younger women and the realities of a mother's life. I urge our club and Zonta International to look at this issue and find ways to be able to support and retain members who are raising young children. My parents were immigrants from Holland and I am very proud of my Dutch heritage. I have always felt I had one foot in Holland and the other in the US. Perhaps this is why I have majored in foreign languages and spent so much time living with families in other countries: I am always looking for my family. It is so difficult to change countries, to emigrate, to raise your own little family far from your own big family. In the United States we see this problem even among non-immigrants, as Americans are often separated by hundreds, even thousands of miles from their own parents and/or children. As Zontians we can and should extend our hands and hearts to other women, both those from our homeland and those who have chosen our community as their new community, as we recognize that the traditional familial support groups women have relied on have changed or disappeared. I am so proud of Pikes Peak Zonta's work to outlaw female genital mutilation in Colorado as well as Zonta International's work in Burkina-Faso and other areas. I can claim I had a hand in it here in Colorado, as I was perhaps the first in my club to tell my club members about this issue. I see in my mind's eye the horrified faces of co-members either wishing the topic had never been brought up or that the tradition did not exist. But we persevered and we made a real change in countless women's lives. In my classroom I often teach about values and traditions that differ from ours and encourage my students to not judge other cultures by our own standards. So I often felt conflicting emotions as my club and Zonta International worked to interfere with this long-standing tradition. Although in this case I am certain that the argument against female genital mutilation is stronger than the cultural traditions that insist(ed) on it, we must always, as Zontians, pursue our goals with the deepest respect of other cultures. Perhaps what seems "wrong" to us is actually the best path for another, and we often need to find a way to support and trust women who are walking a very different path. This a proposal for a project that Zonta members could do in small groups with flexible times. If you would like to be a part of this, please let Renee know what areas you would want to help with. 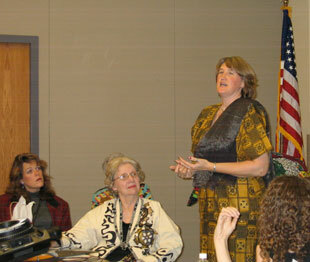 Corrie Johnson, our September speaker with the Peace Corp experience, would like to work on this project. About 7 (along with 1 man) are attending ESL at Helen Hunt on Tues and Thur evenings They are given books there, but only one could afford to buy books for home (her husband has a job and a car). Need: Set of books for home, or at least Student book, $15 each. If 5 bought, that would work for now. $75. More will be coming from Liberia. Need: Pre-employment skills. Work place vocabulary, resume, interviewing, etc. There is a program called WorkStyles that requires training, 2 weeks of classes @ 30 hours each, taught by 3 staff members. Janie Blind, from Adult Ed, ESL at D11 would be a resource for us on putting something together, along those lines with the expertise of our members, we could do this. Janie offered to let us meet with the women on Tues or Thur, about 7:30 - 8:30 pm, at Helen Hunt as option to going to their homes. They have security there. Need: People to volunteer to give them more language help in addition to their classes. Janie can provide training for this. Need: Adopt a family for holiday gifts, especially when small children are involved in families. Will also check with my work office because we do this every year. Maybe people in other offices would like to do this instead of buying each other gifts. Need: Work clothes, basic household items for when they are on their own, dishes, etc. Need: Refugee program always has use (and some storage space) for home furniture in good condition. Need: Food, even perishable can be dropped off at family's homes until food stamps kick in. Computer fiasco. It's important to use the project screening tool. Our guidelines suggest that we think of giving a "hand-up" rather than a "hand-out," or teaching them to fish rather than giving them a fish. This is a halfway house for women recovering from addiction, alcoholism and other serious problems. The director is Paula Stock who offered to be a program speaker. They graduated 15 of the last 20 participants with a commitment time of 4-9 months and a minimum age of 21. They have added Life Skill Classes on Monday evenings which include such topics as: saving money, hobbies, free time, nutrition, grocery shopping, checking accounts and self esteem issues. They could use alarm clocks, single sheets sets, towels, stationery, stamps, bus passes, women's toiletries including hairbrushes. They appreciate our support and hope that we continue our financial gift of $750 this year. This program, which builds the self-esteem of teenage girls, is as successful as ever. Intercept now serves about 100 high-risk girls at Harrison High and about 72 in the 3 Middle Schools - Gorman, Panorama and Carmel. They just returned from a camp experience at Templed Hills and it was wonderful, according to Cathy Stevens, executive Director of WRA - The Women's Resource Agency. The girls could use all types of feminine things and school supplies. They would like us to continue our financial support of $750 this year. Cathy Stevens suggested we consider Dress for Success as a recipient this year. Once its own agency, Dress for Success is now under the guidance of the WRA. They could use all types of professional attire including shoes, purses, pantyhose and underwear. They give a woman an interview outfit complete with new underwear for her interview. The director is Lynda Powell and is available as a speaker for our group. This program continues to teach and publish creative writing for women. Fellow Zontian Ava Heinrichsdorff teaches for this group. A recent program at the women's prison was very successful. They could use our journal donations for those women who cannot afford them and our financial contribution could help with the printing costs of their annual publication, which is distributed for free through the Pikes Peak Library System. In exchange for the monetary gift, we could ask that our organization be mentioned in the donor section. Women's Film Festival - a Colorado Springs tradition in its 17th year, which promotes films directed and/or produced by women. A donation gets acknowledgement in the program. Life Support - supplies mothers of young children with diapers, infant clothing and other necessities. It's a part of Catholic Charities. Cozy Club at Colorado College knits blankets for TESSA, a local shelter for women and children. A Peace Corps project, perhaps involving our September speaker. October Guest Speaker - Zontians Speak! * I could have listened to Jillann speak about her experiences working in foreign countries for hours and hours. Her dedication to helping women - sometimes placing herself in great physical danger - is humbling. What an example of "the power of one!" I commend Jillann for her dedication, her enthusiasm, and her loving heart in serving the women of the world. * Janet - you, your daughters and niece provided us with a wonderful glimpse into the world of belly dancing. This is such a graceful and magical form of dance with its sensual music and elaborate costumes - you all were a delight to watch. Thank you for sharing your talent with us! "Recording for the Blind & Dyslexic - Impact on students and families nationwide"
Nuts will be bagged and ready to deliver by November 8th. at Pat Kosley's home. Soup will be served! Nut facts and recipes from John B. Sanfilippo & Son, Inc. KUDOS to Pat Kosley, our nut queen - from Kris Wells for organizing yet another successful nut drive! KUDOS to Janet Reedy and her girls from Renee Troppe for the wonderful middle eastern belly dance performance. What a treat. KUDOS to Rosalie Dorland from Renee Troppe for agreeing to bring her camera to our general meetings so we can capture the events for the future. KUDOS to all the attending members from Renee Troppe in October for the fabulous International Buffet and the large number of guests they brought.